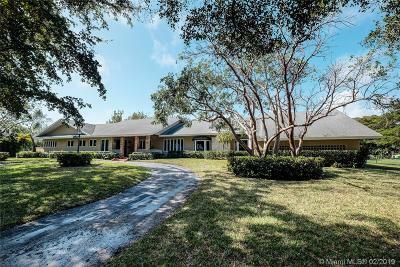 This large (approx 4000 sqft) well updated Pinecrest jewel has a fourth bedroom and bath separated from the other bedrooms perfect for an office, in-laws, teenager, or guests. Tastefully added to and improved by long-term owners this home features high tongue and groove wood ceilings, an Old Chicago brick fireplace and pool/patio, wood floors, large bedrooms and baths w/zoned water heaters and CAH, 3-car garage, and sits up high on a beautiful no traffic street with lots of privacy and lovely landscaping. Impact glass French doors across back of house.